Dept. of Baseball: An Astros-Dodgers World Series matchup is still very much on the table although I don’t think the Milwaukee Brewers will be an easy out. Games 3, 4 and 5 are in L.A. beginning Monday. Reminder: the Dodger Stadium Express offers freebie service from Union Station and Harbor Gateway and the refreshment opportunities at Union Station take a big step forward beginning Thursday. As for Milwaukee, I like to think of it as the Cleveland of Wisconsin! This just in: the art museum there looks nice. Dept. of Walking Dead: It was a tough call but I’m with Maggie on this one. Excellent season 9 premiere. Friendly reminder: Generally speaking, taking transit or walking or biking instead of driving alone is a good way to produce lower greenhouse gas emissions. See this post. FWIW, we have three members of our social media team who work in our Rail Operations Center in Willowbrook in addition to another employee who works in Metro HQ. We don’t have 24-7 coverage but do have our main Twitter feed and rider alert Twitter feed staffed during all peak hours on weekdays, as well as mid-days and weekends during the day. Link Union Station is a really interesting project that could greatly benefit regional rail — i.e. Metrolink and Amtrak and create space for high-speed rail. The project aims to build ‘run-through’ tracks for Metrolink, Amtrak and high-speed rail — so those trains can enter and exit Union Station from both the north and south. At present, Union Station is a dead-end station and that adversely impacts capacity and travel times. 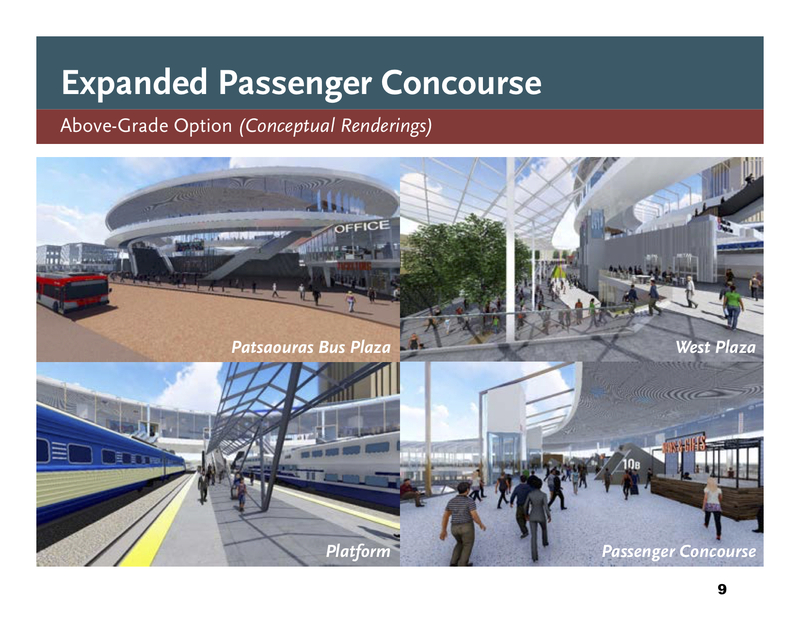 Part of the project also involves building a new passenger concourse above the tracks instead of below. That would be less expensive and be easier construction-wise. See this presentation from which the above slide was taken. When will the project happen? The project would likely be built in phases with the new concourse coming later. And this caveat:funding for the new concourse still needs to be secured. Thoughts? Metro’s web page on SB 1 is here. As a daily Metrolink and Metro rider, I am excited that Metro is investing in improving Union Station with the Link US project; however, I am concerned that the staff-recommended elevated concourse will negate the benefits of this potentially transformative project. Any time savings for Metrolink passengers that come from the run-through tracks will be eliminated by forcing passengers to go up to an elevated concourse, walk in a circle and then proceed down to the station and Metro connections. Let’s find a better solution for riders. Irony alert: the quote “customers often come as an afterthought” very much summarizes the Link US recommended plan. Is it true with the new concourse metrolink and amtrak passangers will have to go up then down twice to get to the subway? It seems even more inconvenient than how the transfer is currently setup. The at-grade option with the roof looks great and is much better functionally than the above-grade option. No need to play Chutes and Ladders to go from train to subway. I hope Metro chooses at-grade. Sad to see metro advancing an option that is going to make for a much worse rail riding experience for metro metrolink and amtrak passengers! But more important than passengers to the metro board is this, it will look pretty for the ceremonial ribbon cutting to the politicians who will never use it other than showing up for the photo op when it’s finished. When does the purple line start tunneling? Tunneling is scheduled to begin this month. The above grade concourse doesn’t include high speed rail. What an oversight? They don’t expect HSR at all? Even worse is why do they need a central train station? The New Jersey story is weird. So they thought safety doesn’t include informing their passengers. Information is just as important as safety for it improves safety. Yes, repeal the gas tax. High salaries means they are just another boondoggle. Both alternatives include high-speed rail. The elevated concourse is much less user friendly than the at-grade option as it requires more level changes to access platforms and for transfers… bad decision, Metro. So you prefer going with the cheaper option for the primary transit hub for Southern California that is supposed to serve the region long term? With something this big? seriously? Again, this is yet another example of sacrificing long term utility for short-term cost cutting. Ridiculous.